Your foster koala is a beautiful little female. Stellar must be one of the cutest little girls you are ever likely to meet and she has a character to match! She is a bundle of energy and is quite the acrobat, seeming to prefer jumping from branch to branch rather than climbing! People seem to fascinate her and she always likes to examine staff as closely as they examine her. She will readily touch noses with us, but often tries to pull us in even closer! She has her mum's big fluffy ears and a very pretty face. We think her checking nature comes from her dad though (that Lance!). 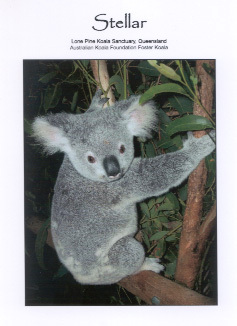 We were so thrilled that the Australian Koala Foundation (AKF) finally was able to process our American Express card. We've been trying to foster a koala since Dec. 2001 and it finally worked! And here is the official paperwork to prove it! They processed us right away when we told them that Uncle Georg was on his way to Brisbane to meet (and potentially smuggle) Stellar back to us. Our official packet is dated June 18th. We got it on June 24th as we were heading to the Producers -- and Georg won't be there until next Friday. They say if he calls ahead they'll set up something special for he and Stellar! We've already sent her a tricycle and some Eucalyp candy to share with her friends. We call her every day at 4 AM LA time (which works out well since she is nocturnal and is up when it is night in Australia). We await more news of the koala-human insemination program. 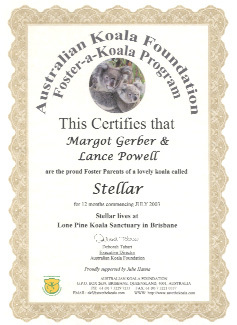 How to foster a koala of your own!